This house has attracted the attention of historians for many years, the following brief account is a summary of a full series of notes and architectural drawings recently deposited in the Somerset Record Office and is an attempt to bring together a number of published notes and drawings with a recent survey and to offer a new interpretation of this fragment of a very fine house. The name Priory should not be taken to imply monastic connections, there is no evidence to suggest that this is other than a house, albeit one of high quality. The building as it now stands consists of three distinct parts aligned east – west along a lane. The E part is of two storeys with a large two-centred doorway facing N, the door itself being of the same date as the opening and having rich decoration and tracery, above this door is an oriel window on a roving of two fan vaults springing from the arch of the door and thus coeval with it. This oriel was originally flat-topped, but is now crowned with a 19c addition of battlements and crocketed pinnacles. In the opposite wall the S, now internal, is an arch corresponding to the N doorway, but in this case a panelled arch with no door rebate. On the first floor at the E end is a tall two-light mullioned and transomed window with cinquefoils in the heads of the lights and a quatrefoil between parallel bars above, the hood mould has heads as corbels. This building is a Gatehouse with a Chapel over at least part, with perhaps the other part as lodging for a priest, fragments of a screen are said to have been found during alterations together with other items such as the remains of a stone crucifix, doors with scriptural subjects in relief, and an altar later placed in East Coker church as a credal table (2). The centre section of the house is lacking in early detail, there are a number of fine windows, but all are of the later 19c, earlier 19c drawings show it as a single-storey building with no good detail, in fact it was described in 1853 as a ‘mere outbuilding’ (3). The W part. of the house is very narrow and now contains two storeys and an attic, this latter is, however, an insertion, the well-finished but simple collar beam roof would formerly have been visible from the upper room. There are several good-quality early windows,.most having the internal rebate which housed shutters and often indicates that the window was either wholly or partly unglazed. In addition there are 19c windows which are good copies of the early type. There are buttresses at this end of the building, set diagonally and original in contrast to those at the E end of the E part which are set square and added. Behind the W building is an added range, formerly a dining room but now a separate dwelling. The W building has no clear function, it is very small and seems to have formed no part of the domestic accommodation, one previous author (4) assumed that the total building as it now stands was one house and that this end contained butteries, this verdict was not based on original research., but on an interpretation of another’s work, it is much more likely that this part of the house formed some sort of subsidiary accommodation, perhaps a Guesthouse or servants’ accommodation. Having decided that the present structure consists of a Gatehouse and Guesthouse, joined by a much inferior structure, improved and made part of the house only recently, one has to ask where is the domestic accommodation suitable for such a house? It must have existed, but was it perhaps of a less permanent nature, perhaps timber-framed, or was it of the same quality as the existing remains? The question can be answered with some certainty from a number of clues – in 1633 it was stated by Thomas Gerard (5): – ‘Nashe – which sheaves an ancient gentleman’s house’, he would hardly have noticed the present building as a gentleman’s house, let alone the house before the 19c renovation; secondly, there is a great deal of re-used architectural detail, for example there are two early windows which use heads as corbels to hood moulds, but another ten heads are re-used for the same purpose on 19c doorways and windows; and., thirdly, we are fortunate in having an eye-witness’s account, albeit rather a flimsy one. Sir Robert Hall has published (6) some extracts from a notebook of a young local antiquary, James Fussel Moore, who lived at West Coker Hall and kept a record mainly of local hearsay and -gossip in the later 1840’s. He records the conversation of William Rendle and Will Short, who, pointing to a window (in West Coker Hall) says: ‘that is one of Nash, the part that falled down, time past’, they also say: ‘I do mind the great doorway, they used to drive through the house, into a sort of court’, and: ‘what is done, Will, with all the carvings?’, and: ‘Oh fine great windows, fine carved windows, broke perhaps when it fell’, and so on. This account led to a visit to West Coker in search of these Nash pieces. Much re-used material can certainly be seen, such as roof finials on house and outbuildings, fragments of stonework in the garden, and windows which may be reshaped earlier work, but nothing can with certainty be linked to Nash. The Moore family seem to have been a rising West Coker family of earlier yeoman status, several of whom seem to have had antiquarian leanings. A John Moore built the barn behind the farm on the opposite side of the road to the Hall, and this has much reproduction work among some genuine medieval windows and is dated 1764, the Hall itself was built by a Dr John Moore in 1839/42 (he later became an archaeologist of some note (6), at the time of building the Hall another member of the family owned Nash, it had been sold to Henry Moore of West Coker in 1718. To return to Nash – where could the main part of the house have been sited? 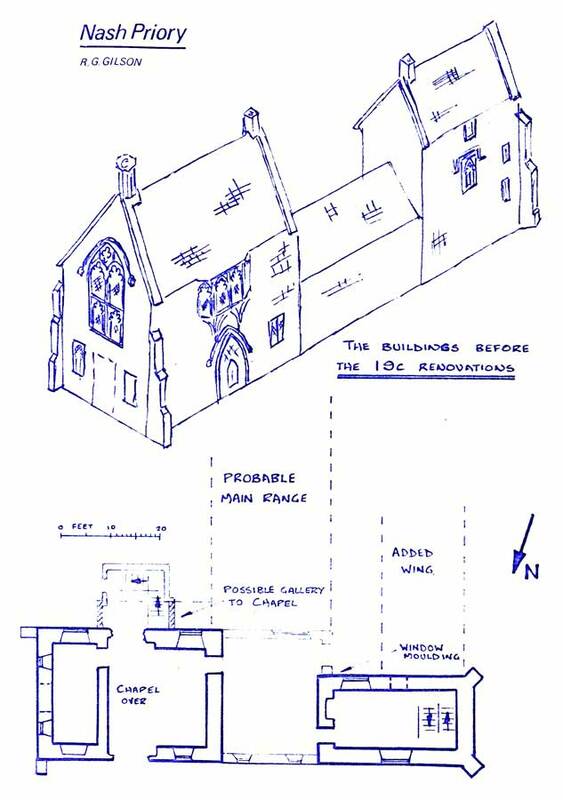 Two clues lead to the conclusion that it stood at right angles to the Gatehouse and Guesthouse with the end gable filling the gap between them – firstly, in the angle between this postulated building and the W block is the remains of a window moulding of an identical type to the earliest remaining complete windows and so aligned that it must have been in a building at right angles to the Guesthouse; secondly, there is a Chapel and a room containing the oriel window on the upper floor of the Gatehouse, but no visible site of stair to reach them, the present stair is in a wing of 19c date. At the head of this 19c stair a small squint in the Chapel wall can be seen which gave an view of the area beneath the E window to a watcher outside the building – this must mean some sort of platform, or stair head here at an earlier date. The 19c. drawings show no sign of any such stair, but do show two wide buttresses on this S wall of unusual shape, they rise vertically, then slope abruptly back to the wall, these could perhaps be the supports for a gallery along the S wall of the Gatehouse from the upper part of the main house to give access to the Chapel, later modified to form buttresses, and now perhaps incorporated in the stair wing. If the house was aligned north – south in the gap between the remaining early buildings, this would explain why these appeared to be totally separate in the 19c, they were not separate until the house fell down. Having determined that a house existed, the problem remains of who built it and when. The latter is relatively easy to answer from the architectural evidence – the shapes of windows and doorways led Pevsner (7) to propose a date of 1400, a date which can be slightly modified by details of headdress on the head corbels on two windows, the horned headdress of a lady, a type which came into fashion around 1410 (8). One earlier author (3) has suggested that the E and W buildings are of different dates, but the evidence of identical window mouldings does not bear out this suggestion. On the question of who built it, Batten (3) has much to say, he ascribes the building to the Courtenay family, but unfortunately his dating is as inaccurate as his architectural description. He dates it to the Tudor period, the later part of the reign of Henry VII. A study of the heads used as hood mould corbels adds to our knowledge, the two on the Chapel window, a lady in a horned headdress and a crowned male attracted the interest of an earlier owner T,oho had casts made and sent to the Society of Antiquaries, who identified then, reference to tombs in Canterbury Cathedral as Henry IV and his queen, Joanne of Navarre (2), and this reinforces the early 1400’s date, perhaps 1403-1413. A further head wears a coronet which contains the familiar stylised strawberry leaf, that is, of the status of Earl or above, whilst all other heads are of the period, they are not identifiable nor precisely dateable. A carved beast can be seen set in the S wall of the W building, a frog-like creature that has an almost exact parallel in one of a series of heraldic beasts on Kilmersdon church (described in as article ‘The Beasts of Botreaux’ (9), it appears that this is a beast rare in heraldry, the toad, emblem of the Botreaux family. Many of these separate strands can be linked together – the article (9) notes a connection between the Botreaux and Mohan families, although the queen of Henry IV was Joanne of Navarre, his first wife was Mary Bohan, and Batten notes (3) that land was held in East Coker in dower by the lady Margaret Bohan, widow of Hugh de Courtenay, 2nd Earl of Devon (perhaps the head with coronet?) at her death in 1392, and her son, William Courtenay, Archbishop of Canterbury, held more of this tenement in 1393. The land at this time was known as the Burels. Mill tenement, Nash certainly being connected with this land at a later date, but no evidence is available for the early 1400’s period. It would therefore appear that Batten (3) was correct in linking this building to the Courtenay family, but not to, the particular Courtenay he chose, James, who held Nash in the latter part of the reign of Henry VII, the builder is more likely to have been Sir Philip Courtenay, brother to the Archbishop (who died in 1396) who is known to have held land as tenant of the lord (of East Coker), Sir Peter Courtenay, in 1403. (1) Drawings, in the collections of Som.Arch.and Nat.Hist.Soc. in Taunton Castle, notably the Roland W.Paul collection (1884), the Mells Manor collection, (19c), and drawings signed WWW and dated 1849. A more accessible illustration is in SANHS. Vol-17, 1854, p.89. (3) Historical Notes on Parts of South Somerset: J.Batten: 1894; pp.173/178. 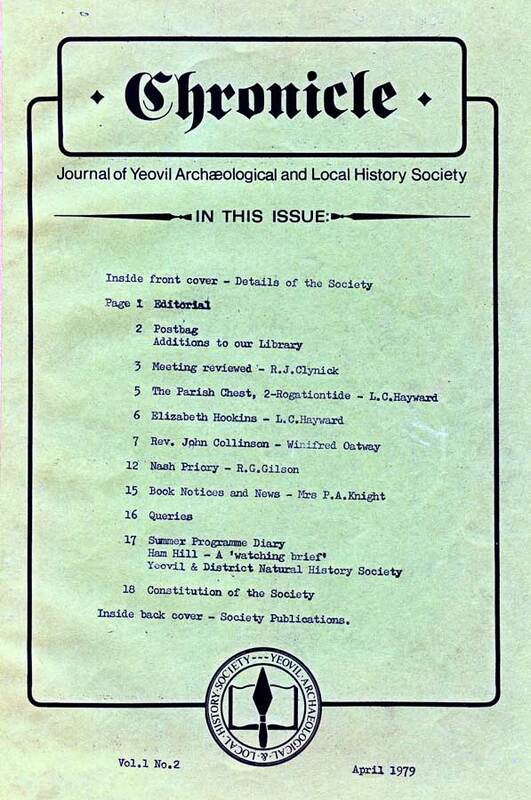 (4) The English Medieval House: M.Wood: Phoenix: 1965: p.197. (5) Description of Somerset: Thos.Gerard, 1633: Som.Record Soc. Vol.15,p.82. (6) SANHS. 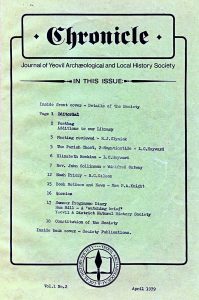 Vol 106, 1962. (7) Buildings of England series: S & W Som: N.Pevsner: Penguin: 1958: p.252. (8)Concise History of Costume: J.Laver: Thames & Hudson: 1969. The author acknowledges his debt to the present owner of the house, Mrs Harris, for her friendly toleration of his numerous visits.